Stevia is an herb native to South America. For centuries, tribes of Paraguay and Brazil used stevia as a sweetener for treating heart burn and other ailments. 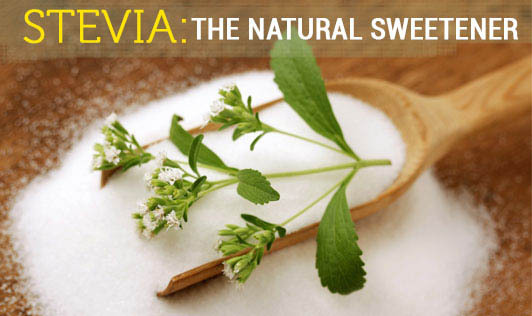 Stevia, known for its natural sweetness has recently been widely used as an alternative to sugar. A compound called steviol glycosides present in stevia is responsible for the sweet taste of stevia. Is stevia safe for you? Stevia leaves and crude extracts are not approved by the FDA; but the FDA does allow the use of the commonly used steviol glycoside rebaudioside A as a food additive, putting it under GRAS (Generally Recognized as Safe). How much Stevia can be taken? Where will you find stevia? Can stevia be used for cooking and baking? Stevia compounds are stable to heat, ph and do not ferment, so they can definitely be used for cooking and baking. The bottom line is that, although stevia is a great sweetener, we don't have sufficient studies to support its use, and there are controversies that surround it too. So, do consult your doctor before trying it.